Cloud Datastore is a highly-scalable NoSQL database which Google promotes for scenarios that require high-availability and durability, and is capable of multiple features such as ACID transactions, SQL-like queries, indexes and many more. This in combination with the characteristic for the NoSQL database solutions of being able to handle different data types, great scalability and the great performance makes it a choice you should have in mind when considering the architecture of your application. 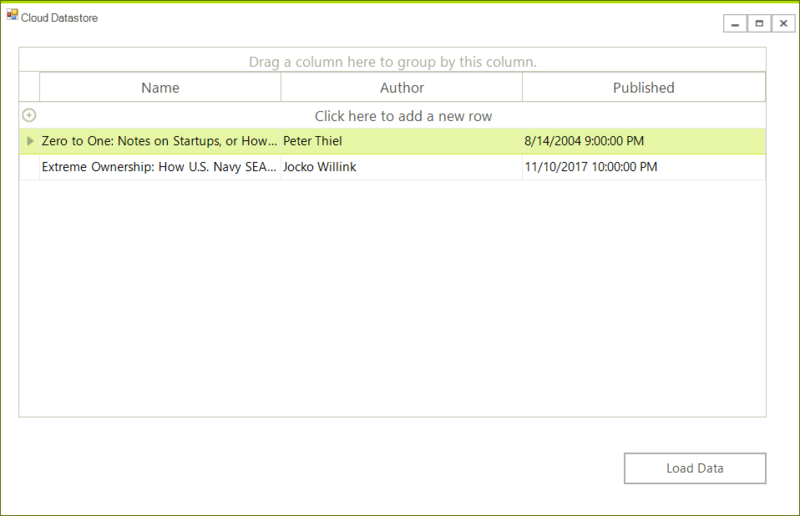 The following tutorial shows how you can create the Datastore instance - Datastore Quickstart. The process is strait forward and easy. You need to add some data as well. When ready your database should look like this. Step 3: Install the NuGet package. 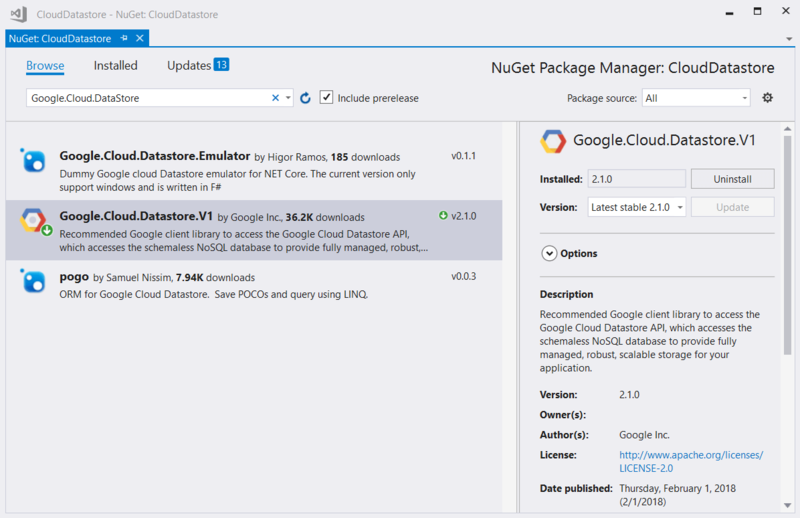 In order to use the classes needed for manipulating the database, you need to install the Google.Cloud.DataStore.V1 NuGet package. It can be found on Nuget's official package source server. Dim projectId As String = "natural-oxygen-200712"
This would not work if you have not added the GOOGLE_APPLICATION_CREDENTIALS environment variable. This variable should point to your JSON credential file. Step 5: Update the database. A proper place to handle and save any changes is the RowsChanged event. 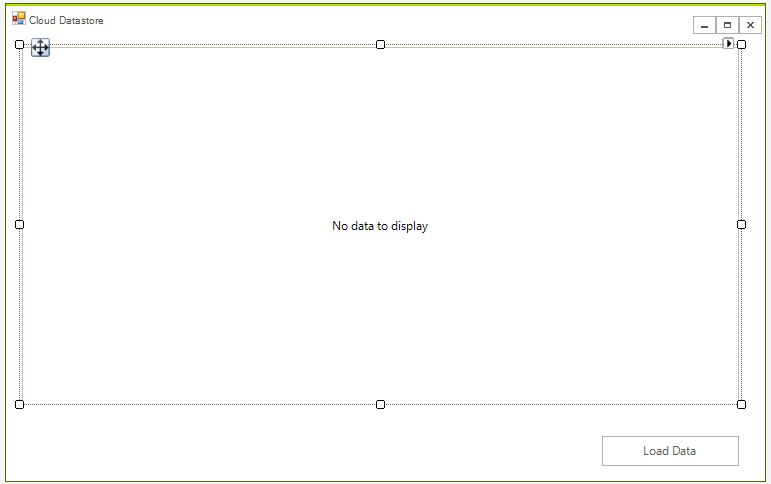 This way you will be able to handle the add, remove and edit operations. The main part is that you need to keep the key of the entity object in order to get the existing items from the database. Dim kind As String = "Books"
Dim name As String = "samplebook1"